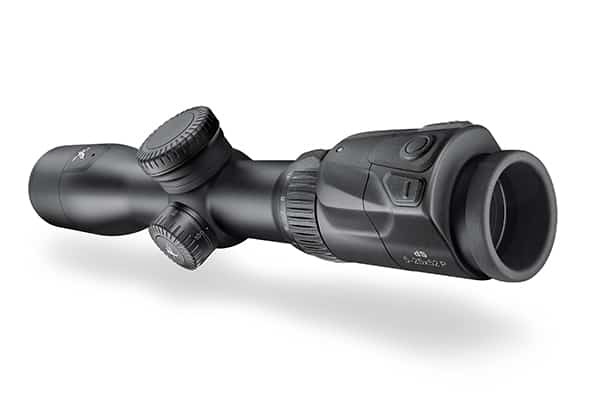 Swarovski Optik announced a completely new kind of riflescope. The new dS scope is a step into digitizing the rifle scope. They combined a conventional rifle scope with digital sensors and a laser range finder to come up with a scope that is unsurpassed in accuracy! The scope not only measures the distance but also takes the angle, the temperature, wind speed, air pressure and magnification settings as well as the ballistic data for your rifle and ammunition. All this with the press of a button with breathtaking speed. The information is displayed in the heads-up display without any further distraction for the shooter. All data is displayed in real time to increase the chances of a successful hunt. ​The scope is capable of connecting via Bluetooth to an app on your smart phone. Basic settings can as such be set through the app in an easy way. This is truly a smart scope! Even though there is connection to the app on the smartphone, there's no possibility to take pictures or video through that connection. That would be an awesome addition and maybe it can make it into the next generation! The scope features a 5x magnification. It's a 5x25-52mm scope. Light transmission is specified at 83% which is not high at all. The rather low transmission is due to all the electronics included in the scope and it is to be expected that the 'smart' features will overall make up for the low rate. It is set to hit the market in Europe in July of 2017. It will be introduced to the US and Canada at the Shot Show in January 2018. Look forward to those dates! If you're interested in 'smart' rifle scopes then check out our article on Laser Range Finding Rifle Scopes!